Creating a culture of change in schools. I collaborated with the EDU21C Foundation and the production team behind the Sundance and Tribeca Film Festival feature-length documentary, "Most Likely to Succeed," creating an Innovation Playlist to inspire change in schools across America. 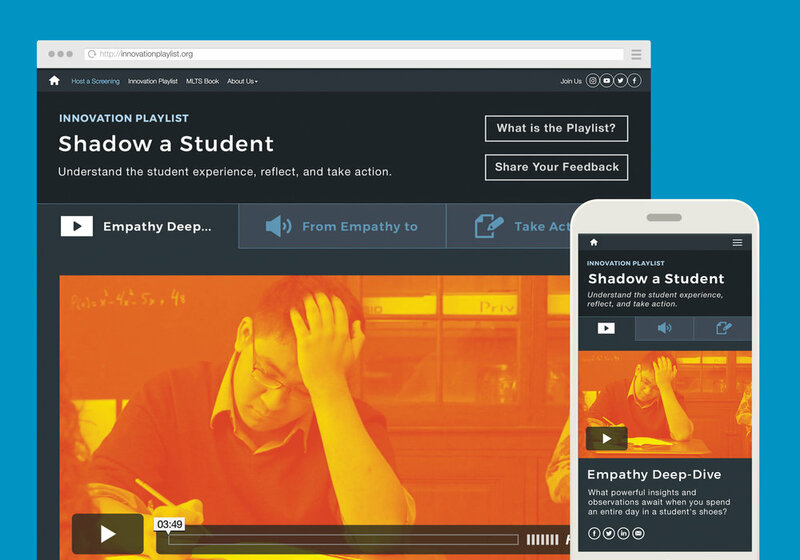 This series of video and audio chapters highlight some of the amazing ways that educators and school leaders are preparing students for a 21st-century world, and offer a curated selection of resources, empowering school communities to revolutionize their thinking. Small steps lead to big change. I led the charge to provide design thinking, user interface templates, content strategy, and brand development for the Innovation Playlist and its greater role in the "Most Likely to Succeed" digital ecosystem. An initial set of six themes includes high-impact visuals and thought-provoking content for teachers, principals, districts, parents, and elected officials to take the first steps to create cultures of innovation. We also created state-specific versions of the content (such as North Dakota, where the Innovation Playlist was introduced and lauded by Governor Doug Burgum), to integrate local educational initiatives and encourage communities to get involved and take action. Asking (and answering) the really big questions. What skills and character traits are essential for 21st century students? What would happen if students led the discussion in their classrooms? What is the impact of students who make their schoolwork public? There are important questions about how to improve schools in America. We developed the Innovation Playlist to provide concise, clear, and catalytic answers and move the needle forward on future educational models that truly can lead to success.